December 31, 2003 was a great day. My family spontaneously planned a trip to Indiana to visit my best friend, Caroline. We drove out that day and got to reconnect with her and her family after 14 months apart. Over the next 4 days, we would have many new inside jokes, play dozens of games of Scattergories, watch “Finding Nemo” 7 times, eat delicious corn casserole, homemade bread and desserts after every meal, visit the sand dunes by Lake Michigan and the playground inside their enormous church, and just love every minute we spent together. But like they always say, “the truth comes out at sleepovers!” And that was exactly what happened that first night. 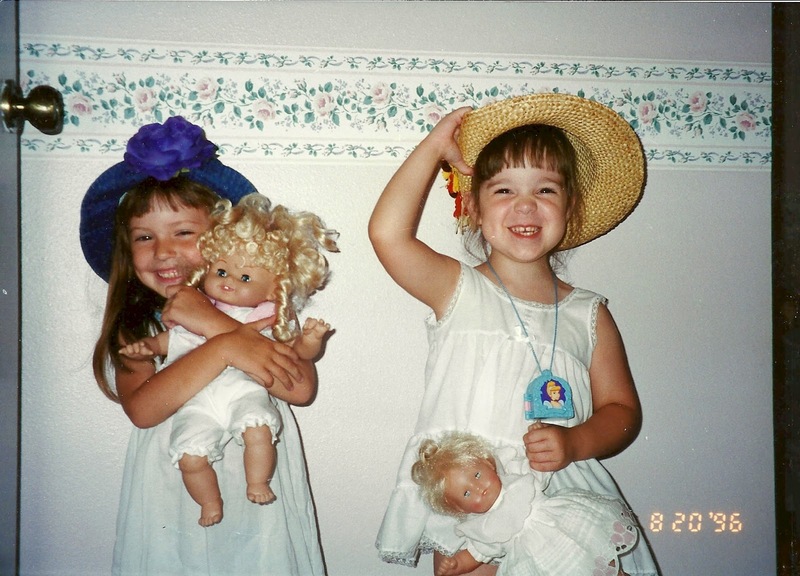 I don’t have pictures of this particular trip on my computer, but here is my best friend Caroline & I, playing dress up many years before – when Caroline still lived in Iowa with me! One of the funny things we used to do whenever we were together. The other funny thing would be picking each other’s toe lint. “I KNEW IT!” She said. “Why else would him rolling his eyes be important?” I took that as a mental note to not mention this to anyone else, in case they were as quick and smart as Caroline is. And that was the day when I first told someone that I “liked” Curtis. Caroline and I, reunited in July 2013 after 6 years apart at my wedding! We returned home on Saturday, January 3. The next day we went to church. I went to my Sunday school class (our class was so big, it was split into 2 groups, so I wasn’t in the same class as him.) and then to “big church” with my parents. After service, around 12: 20 pm, I was standing in the hallway near the nursery, waiting for my mom to pick up my baby sister. I looked across the hall and saw him. He was wearing a hazel long sleeved shirt. He didn’t see me – he was staring the other way, and the look on his face said that he was bored out of his mind. But in that moment I knew…I really liked that boy. He was interesting, mysterious, and talented. I wanted to know him, like really know him. I wanted to know what he was thinking. I wanted to be good friends with him, but I was too shy. I didn’t think I could ever work up the courage to go and say something to him. That night, January 4, 2004, I wrote in my journal for the first time, “Special secret: I secretly admire Curtis J.” And I decided that this is what it had to be: I would be his ‘secret admirer’, and I would tell no one. I was scared that my parents would be mad at me, so I didn’t think I could tell them, and I certainly couldn’t tell any other friends. Caroline knew, but I trusted her with my life, and knew she’d never tell anyone. And so this was my secret…and it stayed that way for the next 2 ½ years. New Year’s Day – January 1, 2013 at 12:05 am – 9 years to the day after admitting I liked this guy, we got engaged!